Kansas’ climate can create growing challenges for more tender plants, but many herbs, which are generally considered hardy, have no problem thriving there. The state has a reputation for being one of the flattest in the nation, but in reality its weather and topography is more diverse. With the state split rather vertically into USDA hardiness zones 5 and 6, several herb varieties are easy to grow there, as annuals and perennials. Basil can be grown as an annual in Kansas, both as an ornamental herb and for culinary use. The leaves of this plant, particularly from sweet varieties, serve as ingredients in many dishes, from tomato sauce to salads, and can be dried to use as a spice. Other varieties, including lemon, cinnamon and licorice, for instance, feature other flavors, Purdue University’s Center for New Crops and Plants Products, explains. Thyme is known as one of the hardiest perennial herbs that can be grown in many regions. Some varieties can be used as ground cover while others can reach 12 inches tall. Many gardeners enjoy growing it in rock gardens because it requires little water and can be harvested all year, according to GardenAction.com. 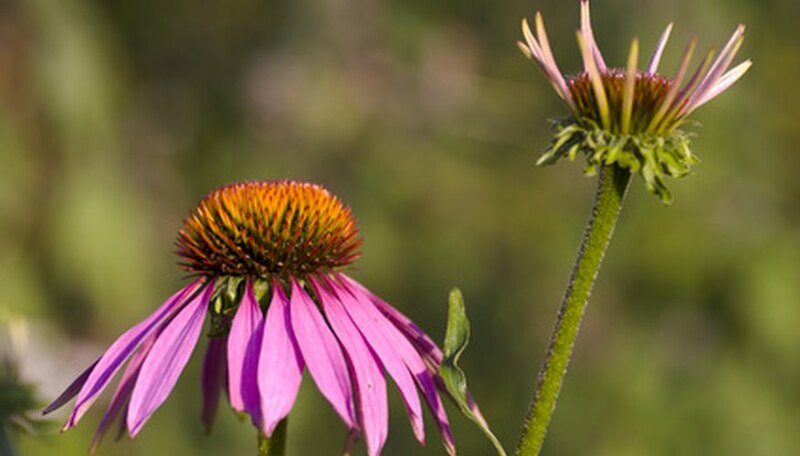 Purple coneflower, also known as Echinacea, produces daisy-like flowers on sturdy stems that reach up to 3 feet high. Grown mainly as an ornamental, it is also a perennial that requires little care. Flowers also come in white, pink and yellow hues, and bloom all summer, making them good for mixing in flower gardens and to use along borders and meadows, according to Texas A&M University’s Horticulture Department. Lavender can be grown as a perennial in climates as cool as Zone 5 if some protection is provided during severe winters, making this another good herb to cultivate in Kansas. Some varieties can grow as tall as 3 feet and have pleasing dusty green foliage. But most grow it for its sweet-scented flowers. It grows best in rocky, dry spots that receive full sun, West Virginia State University’s Extension Service states. Oregano, or “wild marjoram,” can grow well in poor soil. Its leaves are often dried to use as a spice in dishes like lasagna, soup and pizza. West Virginia State University Extension says it smells similar to thyme, but only grows about 2 feet tall. Hardiness depends on species, but many are hardy to Zone 5. Mint can be grown as a Kansas perennial, but like in other states, its vigorous spreading habits can choke out nearby plants, HerbGardening.com warns. Keeping it in check usually means regularly cutting it back, or keeping it in containers that have been sunk into the ground. Mint enjoys rich, well-drained soil and full sun. Leaves are used to flavor tea, desserts and other edibles.